Street life: looking towards Mosquée Ben Youssef in the medina, Essaouira. Leaving Marrakech, the landscape stays flat, except for a few distant outcrops of rock. The sensation of the inhospitality of the environment creeps up on you as the olive groves become fewer and further between and rough scrub runs away to the base of distant hills. Eventually, the landscape starts to undulate as you pass through small towns like Sid L’Mokhtar, and, after two hours, Morocco simply runs out of land as the coach starts to plummet down to the Atlantic coastline and the peeling whitewash of Essaouira’s medina. The morning started with the obligatory slices of sweet cake dipped into apricot jam, with a side of yoghurt and coffee. I had a chat with Merissa who was already awake and wearing sunglasses like she was nursing a hangover. I packed up my bags and meandered my way out of the medina towards Bab Laksour to get a taxi. 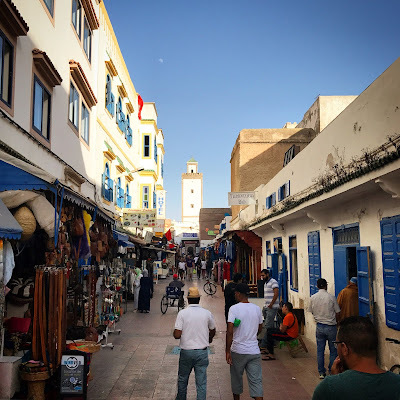 Having learned the lesson last year that taxi metres are always mysteriously broken in Marrakech, I readied myself for a battle with the driver who had emerged from the morning shadows of the arched gateway to the outside world. “You want a taxi?” the friendly looking driver asked. “Yes, but only if your metre is working,” I replied. “That’s okay then. I’ll look somewhere else. Bsalama,” I finished in a friendly tone and walked off. “You can get in,” a man in a blue Adidas tracksuit said, chasing after me. “Get in,” he said, his face looking distressed at my insistence of knocking what equates to about £1.50 off his fare, but that saving would cover a quick lunch later in the day for me. Last year I had caught the CTM bus to Essaouira, but this year, on another taxi driver’s recommendation, I’d booked a seat on Supratours. Supratours are owned by ONCF and so their buses leave from the old railway station building around the corner from the more modern new station. As anyone who has ever visited the small town of Essaouira that clings to the African mainland looking out into the Atlantic sea, the crowd on board the bus was eclectic: Moroccan families, German families, Aussies fresh from Bondi, Americans dressed like they were in Malibu and a Belgian guy who looked like an overweight Jean Claude Van Damme. Amongst the urban gothic mist rolling off the sea, permeating through the tight lanes of the medina, the echoing bells of the water-sellers and the ghostly cries of shrouded seagulls, I’d managed to find an assortment of people to provide both entertainment and good company. Two guys called Khalid, and their enigmatic friend Strex; a Scotsman learning Arabic in Casablanca; an Aussie teacher based in West London; and later on the classmate of a Ugandan friend’s little sister who now lives in Holland. We had initially bonded over luiza tea, amlou and cheap shawarma wraps from the kebab shop opposite the hostel. With the weather being as it was that year, there hadn’t been much else to do except read, chat, and eat, but it was all that any of us seemed to need. It also marked the point that I had first heard any music by Cheb Khaled. This year, I was looking forward to Atlantic Hostel’s ramshackle charms and had spent time extolling them to Marissa the night before. As with Marrakech, the welcome familiarity of the place brought a smile to my face as a young volunteer called Younus checked me in to the hostel. Sunset over Essaouira in the direction of the Atlantic Ocean. A few minutes later, the manager, Yassine, or Couscous as he is more widely and affectionately known, came through the door. We started to recount a couple of stories from the previous summer, at which point Couscous hugged me and spent a good portion of the afternoon and evening plying me with atay and coffee. 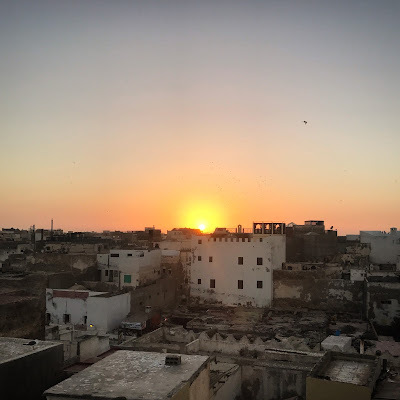 All the while, he prepared food for the hostel’s evening meal to a soundtrack of Tuareg and Imazighen music as more of the evening’s guests rolled in – the music only stopping for various adhans as the day rolled benignly into evening. The meal itself seemed a much grander affair than in previous years. Shortly before the meal, the much smarter downstairs area was set out with large tables, covered in red cloths, all with enough space for around forty people, all lit by cosy candlelight. The starter was hearty and warming harira soup served with the ubiquitous Moroccan flattish bread rolls. This was followed by chicken tagine made with onions, preserved lemons, dates, ras el hanout spices and olives. A really salty rice side dish appeared also with more bread, which was great when dipped into the sauce of the tagine. Dessert was fruit salad covered in yoghurt and amlou – a sort of Moroccan peanut butter made from ground almonds, honey and the key local ingredient, Argan oil. This was washed down with special tea and an impromptu drumming display by some of the staff. Cats can sleep through very loud Tuareg music. Revisiting places of uncertainty can result in you truly moving forward.